The Galaxy S III also has some new gesture controls you may not have heard about. Shaking the device lets you detect nearby Bluetooth devices, as well as update your email, news or weather apps. A double-tap on the top of the device lets you move to the top of a scrollable list. Turning the phone over now not only mutes calls, but also media or radio playback as well. Screenshots can be captured by a hand sweep across the screen. You can pause media playback by holding your palm against the screen. Finally, the camera can be accessed from the lock screen by holding your finger against the display and rotating the phone to landscape mode. 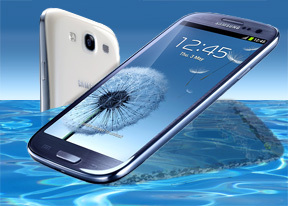 The Samsung I9300 Galaxy S III is a powerful smartphone that will give even the most discerning users no reason to regret their decision. We are yet to see if it will manage to replicate the Galaxy S II success, becoming one of the most influential smartphones on the market, but it certainly has the potential. The Galaxy S III does have the luxury of coming later to the market after its main rivals - smartphones like the iPhone 4S and HTC One X - and Samsung made it count. The Koreans made a complete package out of the S III, leaving almost nothing to the competition to claim exclusivity on. The Samsung engineers made sure to teach their new flagship plenty of cool new tricks (we really love Direct call and Smart Stay), which should give it an edge in the head-to-head battles. Yet probably the most impressive thing Samsung achieved is cramming the huge 4.8" HD screen into a body not much bigger than that of the Galaxy S II. It's also thin and feels very durable (we know how much torture the S II could survive and that one had its display protected by the previous-gen Gorilla Glass). The hyperglazed plastic will not be universally loved, but that might not turn out to be too big a problem - all eyes will be on the screen anyway. It's huge and sharp, it's got beautiful colors and deep blacks: in short, it's the best display we've seen recently. As expected, the whole PenTile thing didn't prove to be a big issue. You'd need a real close look - and perfect eyesight - to even begin to notice it. The software of the Galaxy S III brings a good deal of improvements, though they feel mostly evolutionary with only a few major breaks from what we already saw on the S II after it got ICS. And there are no two ways about it - the Galaxy S III is amazingly fast, occasionally beating its opponents by quite a wide margin. The camera seems pretty good too, but we'll need more time to do proper testing. In fact, we'll need more time to properly test a whole lot of other stuff too - so we hope we whetted your appetite with this preview, but we're far from done with the Galaxy S III.